Appearance (0-20): The first thing you notice is the chisel shape. The cigar has a 52 ring guage, and tapers down to a chisel point where the cap is. The wrapper is a light brown habano, with no real flaws. 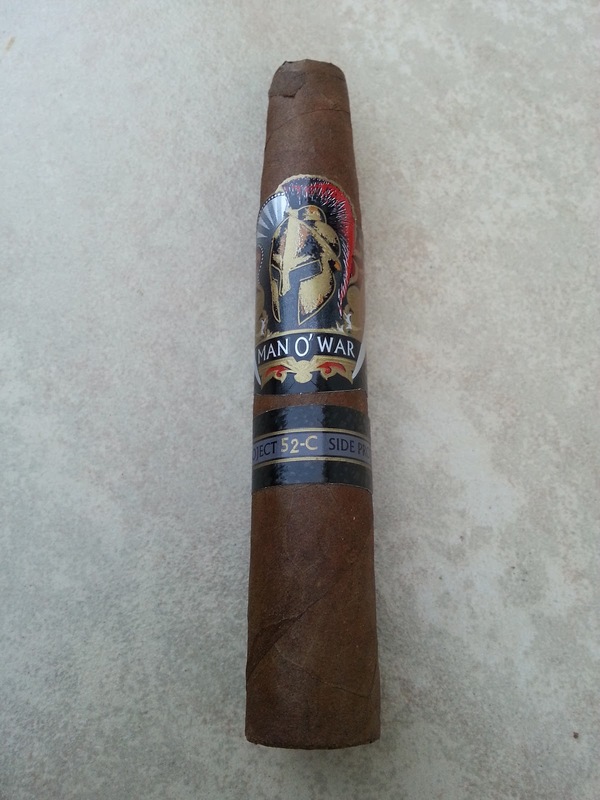 There are 2 bands around the cigar; the original Man o War label, along with an additional secondary label signifying the 52C side project. Construction (0-20): A quick clip of the cap left no debris, and lighting was very easy. The burn was razor sharp and smooth all the way down to the nub. The chisel shape isn’t something that I am a fan of, mainly because it kind of dictates how much smoke you get. This is the main reason that I don’t use a punch cut, because the smoke get funneled to a very small point. Regardless of that fact, there was a decent amount of smoke on each draw. The ash was a strong white color, without any flaking to notice. 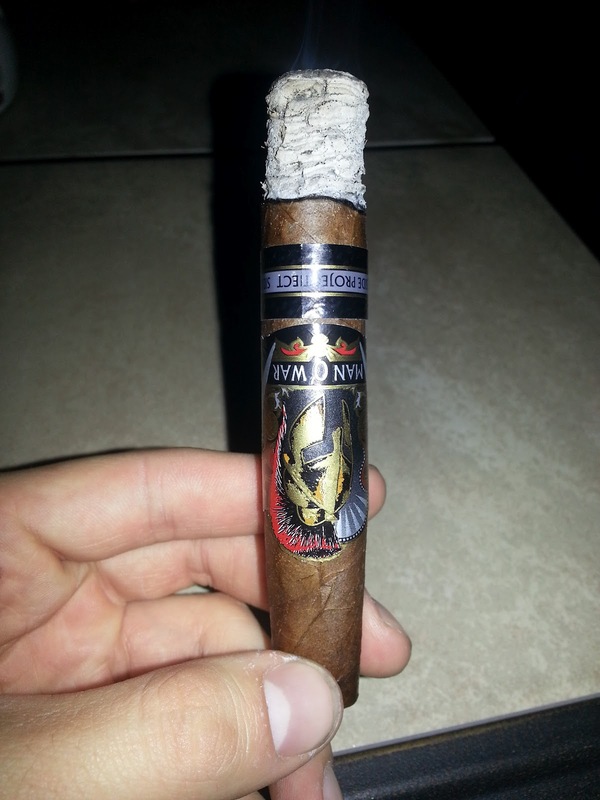 Strength (0-20): The Cigars International website lists this as a full bodied smoke, and personally I feel like it missed that mark. Medium to medium full at best, but the flavor profile was nice. I generally don’t check the profile of the cigar until after I smoke it, so I will dock a few points since it didn’t hit its advertised strength. Flavor (0-20): Right off the bat, there are strong flavors that can be generalized as “sweet.” The sweetness gets very strong in the middle of the smoke, and they are very nicely done. After the first inch or so, you will get notes of wood (oak and cedar), and some splashes of pepper and coffee near the end. Aside from the strength profile, this cigar was a nice complex cigar that leaves you satisfied. AJ Fernandez is definitely a master of the leaf when it comes to blending. Value (0-20): Listed at about $9.00 for a single stick, it’s not terrible. Then again in the same breath, I could list a lot of other cigars that I might pick up for the price and size. 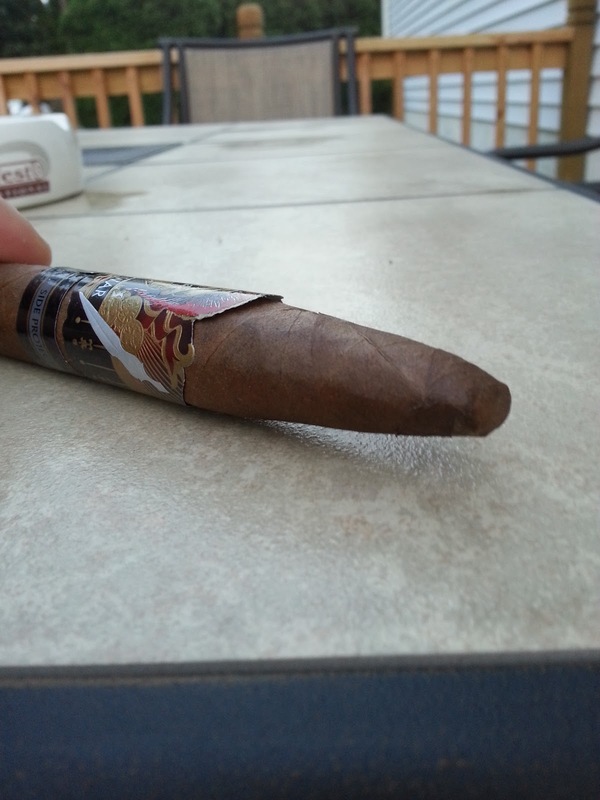 While the cigar was on the smaller end, it did burn for close to 1.5hrs. Additional Notes: Smoked on my deck paired with water. Overall (0-100): Hitting 85 on the rating scale can sometimes be deceiving. 85 is still a very respectable score. 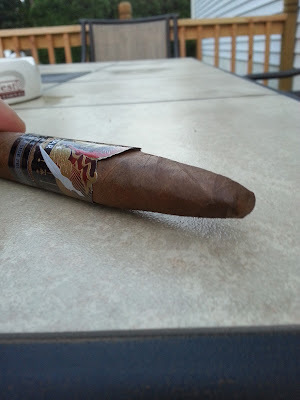 The 52C is a great smoke, but price and strength really knocked it down. If you go into the experience thinking that you will have a medium cigar that is very flavorful, you will be pleasantly surprised. Couple that with finding a deal on them to subsidize the price, you really have a winner. I will be reviewing the other Side Projects very soon (Little Devil and Phalanx).